A Concise Chinese-English Dictionary for Lovers heralds the American debut of a remarkably gifted young writer. Start reading A Concise Chinese-English Dictionary for Lovers on your Kindle in under a minute. 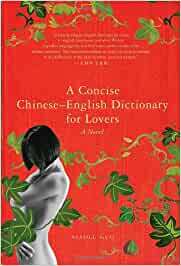 "A Concise Chinese-English Dictionary for Lovers is original, humorous, and wise. Within imperfect language one can find many perfect truths of the human condition. The misunderstandings are really the understandings of the differences of the heart between men and women." "[The narrator's] voice is funny, childlike and wise all at once." "An inventive, often humorous and poignant story of a woman's journey over cultural and emotional borders." This is a novel written in the simple broken English of someone learning the language. It is also a deep and complex novel about the conflict between the universal and the particular in human personality and culture. it is a deep and complex novel about the yearning for both intimacy and autonomy. It is a novel structured around the dictionary meaning of words such as self, contradiction, dilemma, misunderstand, noble, guest,heaven, homesick, confusion .... These are the words that the character grows into somebody who she was not before. She learns English and in learning English she learns about differing views on life living in the present or living in expectation for the future. However, this is not a coming of age novel. it is a novel that tries to demonstrate the yearning fro a universal in a world of particulars. It is a great read for someone like me who works with Chinese colleagues. I understand better their view of their view of the western world. Funny and sad at the same time. Very sweet & sad story of this young lady. Book written by lady who speak good english, but pretend she not. I write review same way. All book written like this. Book more annoying than nice for me to read. Univerity class made me buy book. I no recommend you person read this book for the fun. If you have to buy book, cry all day. collective instincts, the stamping out of the individual, and family life and like most of the diaspora its left a haunting mark. What she finds of value in her land, is the family she had, where the family is the personality and all contribute to the collective of the family..she meets someone she likes and wants to encounter. Here she is the zillionth occupant of the ancient mainland, and the thought processes of eons of collected thought are bound up in her..as she meets the elite mind of western culture, in Europe, what she sees as the more philosophically advanced and sophisticated..and they travel throughout England and talk and she tries to use words and language encounter her friend..enjoying scones..and as she recalls the husks of her family life..and her new place trying to find a home..the ancient garden back home, the trees and flowers vegetables and many elements of nature..the people are absent like Mao and the milennia of people they represent..they no longer resemble the people of the ancient past..news is newspeak..and even Mao is gone..and here she is trying to find some identity..but the yearnings of ancient times remain strong there is talk of buddhism..trying to find what will bring happiness and love..to the deepest part of her..to her spouse..her wakes each morning and "picks up" the newspaper..and her reflections about the ancient land to the new land where the old is the land of values and here in europe..individualism in excelsus..
she has no way of understanding it. It doesnt flow down her stream and at novels end she departs from her lover still in love..she doubts whether her new found love loves her..on p 335 we read "loveless"..she wonders if she's an agnostic, sceptic,fatalist..at least she feels at peace that she's not an anarchist and she returns home..still wanting to learn much. She comes home to Beijing from "western philosophical nonsense"(p 350)..the west seems so strange to her and here she is still not at home with the people on her return..a person wanting to find a place to call home a home.."scared..think..love..thoughts"(p 336)..I enjoyed her novel and its fellows that followed and I think its authentic and expressive of the alienation in modern times that some feel, and I find it a great novel and will look at its fellows later, and one of the novelists I take seriously who doesnt put happy endings on novels and her endings show much of her life and search for love remains unresolved, and she's still clairvoyant about her emotional life, without denial. Besides streams of consciousness which she tries to follow through onhere, and which is her modern approach, and the devotee of film and film writing make the best of partners with the modern novel in all ways, each reinforces whats best in each other..there's a sociology here which I read years ago in a philosophical-religious piece "introverted or turned towards the world"..by Schillebeeckx E which discusses the change in culture from eastern and western society..and why did ancient people find it so much easier to find faith and love than we do today..a complex problem and there is much in this novel that i've elaborated on..but each must take it in their owm way..in their own stream of thought..check out her other books!! A very unique book and reading experience! Highly recommended for a reader seeking something out of the ordinary. The author creates excellent character development through the first person perspective, that demonstrates universal experiences of human emotion.